"While I appreciate the fact you want a second opinion there are two big reasons why I know you don't have a broken bone in your leg..."
Everyone have a great Thanksgiving!!! he,heee!Wonderful characters and joke! !Love it!! Oh brilliant! Really funny, I love it! Sort of reminds me of an old joke about economists as in how many economists does it take to change a light bulb? None, because the invisible hand does it. Boom tish!!! He may have a broken leg... in his stomach. What's up with all of the teachers you're working around lacking humor? That would drive me crazy. 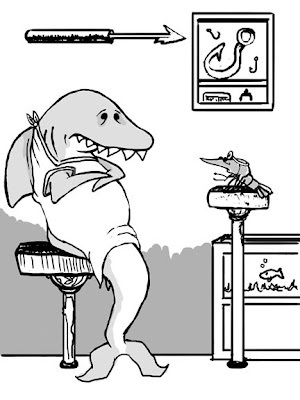 Great illustration, especially the face on that shark. He's looking mighty worried. Have a great Thanksgiving, Brian!